It's been a long time that I wrote anything under Essentials. I found this topic obvious. A recent comment debate shown its not. An alchemist on this market gets 10 G profit for every gem. If you were alchemist/JC, you would get 20G right? Well, yes, but with 2x more work. If the alchemist and the JC are different people, they both do half the work and get half the profit. It's not some mystical "synergy" that created your double profit, but simply working 2x more. If Eternal belt buckles sell with 10G profit, you could be Alchemist/Blacksmith or JC/Blacksmith for exactly the same profit ratio. It's sad that I even have to mention the "synergy" of Herbalist/Alchemist. Just because you farm the herbs, it's not free. You could sell them in the AH for the same price. Having multiple professions simply sum up profits from working in multiple fields. OK, there is a small synergy: no AH cut, and no time spent in listing/retrieving. But I wouldn't level an alt just to save a run and back between the mailbox and the AH. Note: having multiple professions allows you to work more. If you are just alchemist, and you listed all goods that sell, you are done and can't do more. If you have another profession, you can start working that. So more professions mean more gold. But not more gold/hour. Some exceptions: if the server economy is really weird, like very low population, your income can grow more than 2x for having 2 professions, simply because you don't have to wait for someone random to craft items you need for your profession. However spamming /trade helps even on such realms. Here's hoping the new goblins race in the expansion have a racial passive to reduce the AH cut. You are just right. But having multiple proffessions makes you less vulnerable if one of your markets crash. That's why I try do have more than just one. You forget one important thing. You need someone who will do the second part of the work, or you'll have no profit at all. Uncutted gems are useless. Let's look at tailoring+disenchanting synergy. Cheapest crafts that can be disenchanted and sold for profit are useless (well, white mask is good for alts, but selling 100 of them in one evening? doubt it). You can sell them only if there's an enchanter who checks AH for cheap greens. And i doubt that you can sell them for half of the profit. And if you're that enchanter, you can only rely on luck and nothing else - fishing AH for cheap greens will not make you half of the profit you could do by using both professions yourself. Thank you, this is the most clearly I have seen this idea written. I've lost count of how many I've met that seem to think that using the AH is some fast track to being broke. Of course, there are synergies, they're just not in moneymaking. Some raiders may care that Blacksmithing + JC, for example, lets you place your Dragon's Eyes more easily. Uncut gems are amazingly valuable. Even on my empty server, people are still scrambling for 450 JC to cut more epic gems. And while you're right, you stand almost no chance of reclaiming the value of levelling greens, you would probably end up with more cash taking Mining or Skinning on the way up and then rerolling enchant later. At first, i don't like skinning and mining at all :) Second, i've already made profit with this combo, on top of covering the cost of leveling enchanting and tailoring. And you can make money from the very start, as even linen cloth can be converted with profit. I don't agree that haivng multiple professions on multiple alts is a waste. To my mind the first half hour a week I spend leatherworking is the most profitable. To double my profits I need to spend five or ten times as much time. However by getting a second profession I can spend 1/2 an hour on that profession too and make almost double my return for double my time. The same argument applies from 5 minutes/week (just doing cooldowns) up to 2 hours/day. Having extra professions makes any extra time investment more profitable than if you didn't have those professions. I've done that too, and I entirely agree. You don't just pay the 5% AH cut, you also pay the AH listing fees, and the time spent on collecting returned mail. That's completely wrong. Let's say you have JC and Blacksmithing, two things completely unrelated, so there is no "synergy". With JC you cna only make a certain amount of gold per day, since that's how many gem sells per day. You can't make 100 epic gems and expect them to all sell at the end of the day, despite how much you undercut, there simply isn't the market. Also, even though you only spend 15 minutes a day posting gems, that's the max amount of time you can put in, as there is a limit to demand. So Assuming this, no matter how many hours you spend only the first 15 minutes are really worth it. Now worth another prof, as Blacksmith, you can do the same thing and not interrupt your gem market. See, it's profitable if you plan to spend more time than to just maximize the profits or one profession. I disagree. For multiple reasons some stated here. More professions help you maximize your gold per hour. And assume that each transaction takes 1 second to make and list on AH. So in day 1 both professions make the same profit. and you gain 10g/s. In day 2 Skyflares raise to 31g. Therefore: Using Alchemy 11g/s, Using JC 9g/s, using both 10g/s.So I just list skyflares. In day 3 Skyflares drop to 29g. So using alchemy 9g/s, using jc 11g/s, using both 10g/s. therefore I buy skyflares and cut them. 2) Market Crashes. Say other goblins joins your glyph market and your profit drops from 3kg/hour to 700g/hour. However Enchanting still gives 1k/hour. Time to respecialize. 3) Opportunities: Patch day. Epic Gems sell like hotcakes. Maybe in normal days Inscr makes more money, but wouldnt you wanna be a JC at this time. 4) Double Conversions worth much more than the sum of the individual two. Example: Eternal Earth to Infinite Dust conversion. As stated here nobody is going to buy your Shadowmight Rings, mostly because its less frequent that people are looking for them. Also you'll rarely find shadowmight rings on AH on any mass produced greens for that matter. I'm not saying you'll never find any, because you will when someone levels a profession, but it is not as sure a profit like when you find the Eternal Earth at a resonable price. Simply put, to convert a liquid asset like Eternal Earth to another liquid asset like Infinite Dust, you must step through an intermediary non-liquid asset like those rings. This proves Synergy. 5) Time Scalability. As the previous anonymous said the returns of spending more and more time into a profession are rapidly decreasing. So you spend the "quality time" on each of your professions and make a lot of cash. Anyway these are just a couple of things from the top of my head, I am sure there are more..having more professions do increase your g/hour. Personally I have both JC and Alchemy (Enchanting, LW, tailoring, all the gathering ones as well, but I don't use them so much to make money). I get to transform all those green gems that never go anywhere otherwise, and the blue ones that go from 20g to epic 200g ones once a day. I keep any extras that proc. Makes my life easier than depending on somebody else or having to buy everything from the AH :D I wouldn't level them just to make more money, but since I didn't like professionless alts they do come in useful. All professions have a diminishing returns on the amount of gold you can make per hour spent. If you have more professions you can spend more time picking the "low hanging fruit", easy high-profit/gold-per-hour items from each profession rather than trying to increase your gold by making additional less profitable items from a single profession. before crafting and listing you need to get mats. For other professions it's not as fast and easy as buying herbs for alchemy, so it takes time too. Or as i've said, there can be no supply - no cheap greens, or very little amount of them. Or just extremely expensive reagents since people are buying them in mass due to the last patch changes. The less you depend on others the better your chances of getting good prices, at least for me. Not that I won't buy ores from the AH or providers if the price happens to be right, but sometimes is good to be able to grab them yourself. Most of the people commenting missed the specification Gevlon made regarding the professions of the alts in question -- they must be considered to be a 'synergy'. Diversifying your professions is what most of you are referring to, and I don't think Gevlon would disagree that this can be beneficial (as it is simply multiplying your niches). There is certainly a difference between the two cases, however. "So more professions mean more gold. But not more gold/hour." For the masses of people who are not gold-capped, this might be a worthwhile trade-off, since it does allow for money gold/week (at the price of 2x playtime/week). For instance, if one's goal is to make 10k gold in order to finance and gear an alt, then making that faster might be nice (because your alt is leveling up at a certain rate). Where I (the top anon) disagree with you/Gevlon is best shown with an example. If I spend 1 hour/week on JC and earn 500g for the first 30 minutes and 300g for the 2nd 30 minutes. However with Ench I can also earn 500g for the first 30 minutes and 300g for the second 30 minutes. With just one profesion I earn 800g in my moneymaking hour. However with both professions I earn 1000g in my money making hour. Therefore more gold/Hour. You have demonstrated how having more professions allows you to work more. You have not demonstrated a synergy between the professions. * CD from each profession? * Working on different profession that don't need each other at all? * Be ready for a market crash? * Spent thousands of gold and TIME powerleveling just for a patch? * Where did he say it was a "waste"? * "Let's say you have JC and Blacksmithing, two things completely unrelated, so there is no "synergy"." do I need to say more? The key of this Post is the tittle "Synergy?" please don't post saying "you are wrong, I can make more money with 2 unrelated professions" that's no the point. You're very wrong! And I'm actually a quite baffled that you seriously believe this. This is just a (very) simple and untested theory what you're writing down here. The fact is that you completely ignore AH time spend! Scanning, posting, adjusting, even if it all goes automatic takes time. MOST time even. Crafting is just a minor inconvenience. Even if AH only takes 1 minute, which is DOESN'T, then having 2 professions on alts that takes 10 minutes still increases gold vs time. The reason is: for the 2nd profession you lose the need to AH, it's a straight in-house conveyor belt production. How on earth can the first situation give the same amount of gold vs time spent vs the 2nd. The answer is: it can't. Multiple professions on multiple alts is more profitable even if you just look at time spend, ignoring all other the good reasons others like Okrane give. Gevlon, often it's not a question of direct profit percentage but secure supply (I'd posit the low population server exception you mentioned is a more general case than you believe). Under an ideal market, there is no major benefit to any particular set of professions. However, the majority of players don't do step iii, leading to a scarcity of these by-products at AH. By having an interlinked crafting profession pair, you can ensure a degree of security of supply your competitors generally don't have. I'm gonna repost the first part of my example because some people seem to not get it. Say you have Jewelcrafting as your main profession. And for the second you have a choice between Blacksmithing(completely unrelated) and Alchemy (with some synergy). Also lets assume that blacksmithing profit ratio is a constant 10g/s - simplifies things. Now A is the player with BS/JC and B the player with Alch/JC. Therefore Player B who has 2 professions with synergy has a better average. I was going to write a post about how you were wrong on this one but i guess most of it has already been explained by the other people. What you're saying would only be true in a market where everything makes you the same amount of gold and takes you the same amount of time. Furthermore the market has to be endless or saturated at for all professions at the same time. + Adapt to market changes and pick the most profitable or spread your chances and craft a little from everything. - Hard to keep a clear overview when branching into multiple professions. + Low time investment after the initial research. - If the market fluctuates a lot your income will be very random. It's a bit like supermarkets selling other everyday things besides the food. It doesn't really cost much more to put it on display but you will make quite some more money. Spending 5 minutes picking a single prime item from each profession can produce some staggering gold/hour numbers. Each profession has select items that can be sold for high profits, and picking all of these will yield more gold per hour than spending time trying to scrape every last penny out of a single profession. I could futz with a profession for hours, but the items I make in the first 5 minutes will have the highest profit. Beside cherry-picking the best items, there are synergies. I spend maybe 15 minutes a week on my Alchemist, but the benefits he gives to my JC are huge: I get all the metadiamonds I can sell for the cost of the eternals, and he pops out a cheap epic gem every day. No extra work, but an extra 500g a day in profits. And from a tightwad point of view, there's the advantage of not having to give my gold to anyone. I make my own vellums, flasks, gems, enchants, armor and weapons. The only people who get my gold are farmers (minions). Sometimes it is very tempting to take up more professions which can make or gather things you need. It is particularly tempting when those materials are in short supply on the AH and/or they seem to be very price-inflated. It is a hard lesson to learn in life that there are things beyond our control. I agree that some synergy between two characters and their professions can be a good thing, but beyond that, there are diminishing returns. It is nice to be able to gather frost lotus with your herbalist/inscription character and send them to your tailor when he needs to make the emerald bags. But everything should be in moderation; if you take this too far, you will end up with a character for every profession, and you have made a game into a job. One real value that the other professions have provided me are channels to unload an item. In the JC -> Alchemy Meta example. You sell as many mats as you can on the AH and instead of flooding that market, you shift some into metas. It still don't save you any time, but it will allow you to flip some deals faster in higher volume. They also give you flexibility to profit on different markets when they shift or you see someone unloading something dirt cheap. It has little to with synergy as much as different channels to make a profit from. Whats that? borean leather 1/2 off, I know I have a leatherworker someplace. Enchanting does have a synergy with all the crafting proffs. I cant see how it is not a profitable synergy - you'll not sell rings/daggers etc in bulk for the same prices you'd sell dust or dream shards. If you had, say, JC/BS on your main then levelling an alt with enchanting would dramatically increase your potential for profit. The other quirk is that WoW effectively requires players who care about their stats to max two professions for self-only perks that cannot be earned by other means. Getting that second profession required work, but that was a sunk cost that the player undertook for some other reason. Once the player HAS two professions, there might be opportunities like the savings on AH costs to be earned from having "synergy" at no cost to the player that they incurred specifically to get synergy. I.e., if you're going to max two professions anyway, and their self-only benefits are comparable, there may be a slight advantage to the one that offers synergy. I agree that most examples are simply people explaining how they can take the best of both professions and make more gold per limited time. I don't think those are synergy, but there are certainly good examples of synergy being more efficient and profitable out there. Example #1: Enchanting and any equipment making profession. If you can turn raw materials such as cloth and metals into enchanting materials at a profit there is synergy as the combination is more profitable than either process individually. if you make armor to sell on the AH for others to DE and you buy armor on the AH to DE in order to sell mats you will make less money than skipping the AH altogether and doing it all yourself. That is a synergy between the two professions allowing a greater gold making oppurtunity than the two independently. Even if you skip the AH and ty trading in the Trade channel you will have spent time which decreases your efficiency. Synergy. Example #2: Glyphmaking and Alchemy. Both use the same materials for production. By being able to by material in greater bulk you can decrease your overall material costs since your raw materials are used for both professions. By being able to swap between professions you maximize the return on investment for those materials by making the most cost effective items across both professions. In this case, having only one profession would mean selling for slightly less periodically, or having periods where you didn't sell at all while waiting for prices to return to your sales point. Synergy. There IS synergy across some professions, it's just that in the current in game economy they are not huge money makers. No one will pick up tailoring just to create low level enchanting materials and no glyph maker is eager to pick up Alchemy for the meager profits it currently offers. That said, however, synergy exists even if it is not so profitable as to make it a major concern. In both examples I list though, you do no extra work for the increase in profit as it comes strictly from happening to have both professions which is pretty much synergy. I do find that Glyphmaking and Alchemy do go well together if you alreedy have them. My primary focus is glyphs, but I do get over stocked on herbs and use Alchemy as a way to move that extra stock. I have convinced my farmers that all I do is mill the herbs so adders/lich/icethorn have the same value. I will take every herb they farm if they give it to me at the price of the adders. Before they vanished this last week, they were happy to give it all to me dirt cheap. I never turned them away at the right price. Once I have enough ink to last a week, the rest goes into flasks. They still make a profit when I price them to move. There are a thousand things that could happen to shift things out. Is having two professions a good thing? Of course! If you're going to play the game at 80, it's required. Almost no one has talked about synergy between professions. People are all talking about diversification. Let's use this as an example based on what someone said before. Let's assume all crafting professions make 500g per hour for the first hour (and less from there on). Then it doesn't matter if you have JC/LW, or JC/BS, or JC/Alchemy, or BS/Enchanting. All of those combinations will give you 500g for the first two hours. Notice how their all the same, whether it's JC/Alchemy (which have direct correlation) or JC/LW (no correlation at all). Synergy is where the whole is more than the sum of the parts. In 95% of circumstances (low pop servers, strange economies) this doesn't happen, beyond the maximum of what a market can handle. But you don't make significantly more profit selling JC/Alchemy than you would JC/Inscription or Alchemy/Inscription. Therefore, it's not synergistic. Gevlon didn't say it's worthless. He said that it's a myth that you make more money per hour just because you have professions that work into each other. Notice that both of the benefits have to do with leveling out income to deal with spiky situations, and both of the consequences have a time component. And remember! If you see a major market shift coming ahead of time, you don't need the profession to profit from it. You didn't need to have mining/jewelcrafting to make a profit off of titanium ore on the release of 3.2. Most of the "Synergy" from multiple profession alts comes down to vertical integration. Say a vertically integrated producer of meta gems can gain a 10 gold profit off of selling the transmuted gems. They are then able to use this profit to sell cut meta gems at uncut meta gem costs as a way to undercut the market and drive away competition - and reaping monopolistic returns over the long run. Assuming you don't compete via this method, a free 5% extra cash from not having to pay AH fees twice adds up (especially in the epics markets). I think that a big part of the problem here is a confusion between synergy and diversification and specialization. I think this confusion stems from Gevlon's original point where it's not clear what he means by synergy. The second issue is that I think it's difficult to evaluate such questions because a great deal of depends on the way the person plays the game. In theory, in a perfect market, the only advantage synergistic profession should have is the elimination of the 5% AH cut. But the problem is that WoW economies are not perfect markets; sometimes they are very inefficient markets. The result is that whether or not synergies among professions makes it worth the effort to level another alt is more of a gut judgment than it is any rational process. Synergy explained as a combination of two things where the result is greater then the sum of its parts. At least that is what i read. In other words, a combination between alchemy / JC would net more profit in total then either alchemy or JC could net alone if you added their maxed out profit together. It won't happen. I make most of my profit on my jewelcutting since alchemy is a crap market to begin with. Alchemy elixer master hardly has any good money makers, the best you do is on average a 10 / 25% profit margin. Most stuff won't sell since alchemy buffs, though potentially really powerfull are not and will not be used by M&S. Only the dedicated raiders / players are willing to spend any gold on them, and they have acces to others providing them via guilds and such. In essence the elixers all won't sell with a few rare exceptions and everyone is making those. Same with flasks. All in all you'll see market prices that are similar or even below mat cost. My main source of income in this market was relying on my elixers to proc giving me some extra to sell. And the market was flooded. On average at least 50+ listings of the same item with heavy competition and undercutting. Potion master, far fewer items to list, mainly potioins and those didn't stack then. Potions on the other hand are being bought by moron's and slakers and used a lot more frequently. Prices at material cost levels always. Only way to make a profit was to rely on procs. Making elixers won't help due to the issues in the market described above. Transmutation master, Works only on earthsiege/ skyflare and cooldowns. Meaning very few procs. Selling uncut gems has a 400 / 1200 profit ratio depending on your choice. But its only 1 a day. There is some competition but overall the market demand ensures your stuff being sold. Selling earthsieges / skyflares. In some wierd way they sell for around material cost aswell... Must be the alchemist mind set.. When choosing the right cuts a jc can easily double his investment yet the market is still nearly flooded with the stuff only a few gold above material cost price. You may get some nice procs. Unfortunately only 1 alchemist can support the market for ALL cut meta gems on a server. Wich is probably the reason why the stuff sells so low. JC demand of the items is too low. Now as for the jc side, I sell two cut earthsieges. I dominate that market. The alternatives are all selling a much smaller profit margins. The two i use have a decent volume and not enough competition to bother me. Eternal has far more volume but on average sells close to the earthsiege uncut sell price on the alchemist And demand isn't high enough to justify changing a 200% profit in one place with reasonable volume to a 10% profit somewhere else for increased volume. All in all earthsieges make up around 60% of my trade income. Now if i were an alchemist solo, i could increase my volume of earthsieges and skyflares immensely. I'd create a larger profit due to the volume i was selling. Currently there are between 0 / 30 earthsieges selling with a 5 / 10 g profit on each of them regarding mat cost at any time. Most of those are sold and the market is hardly ever empty. Demand has met the supply. If i started dumping there at lower prices initially the prices would lower, The demand would rise trhough the roof and perhaps increase 4 fold. I might even be able to raise prices up to where they are now. I'd make around 300 / 400 gold a day selling the transmutes on alchemy that i DON'T make when not combined with a JC. And the reason is following: All those uncut meta's would be bought by jc's They would then cut them and sell them in the ah. The increased volume on the supply side would drop prices on all meta's. Overall they would all sell much cheaper. My profit margin would be destroyed. Instead of selling around 25 meta's with a profit of 500g i'd be selling less of them and at a much lower profit. In essence controlling the transmute market with my alchemy would destroy the meta market for my jc. And in the long run the massive volume of all those meta's wouldn't get sold. The demand simply isn't there, meta's would drop to the same availability / demand curve as all other non best seller gems. Lowering prices and taking countless relistings to sell. All in all the synergy between the two professions ISN't there. If there is a synergy its actually a negative one. By maximising your profit in one of both you are limiting your revenue on the other profession. You are forced to deal with the synergetic products, where you can only maximise revenue on one side. In an endless demand market you could do so on both sides, but that means you'd prolly sell all to yourself still since that gives you two times the profit per product. In essence you can't sell more stuff then to yourself with synergetic professions. All other stuff increases the competition with yourself, thus lowering your prices. When having only one side of the balance you don't care what havoc your wreack on the other side. Heck even with only 1g profit those meta's will generate more revenue selling 1000 of them then they would selling 400 for a 2 g profit per item. In essence you'd drop your price untill you found the ideal balance where you dominate the market. and maximised your revenue. When you're also buying off yourselff in that same market. You will see your endmarket crash to bits in doing so. Every single JC would buy up stocks at first and start selling them in small quantities. That alone would increase the volume sold in the end market with 400% easily. Then some goblin would come around calculate his profit margins and start moving in bulk. He'd quickly dominate the market at a price and volume he finds comfortable picking up all the action. The demand side hasn't changed though. All that you have done is lower prices on both your markets. Made the market uninteresting except for a few stayers that still work them through habit for some small revenue. 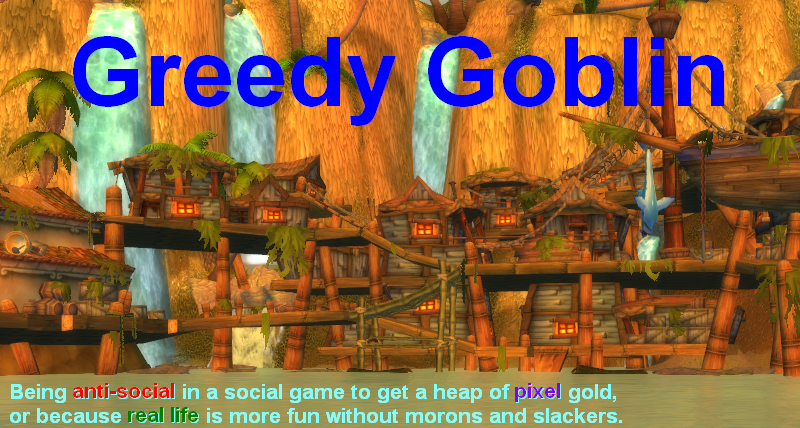 And a happy wow community since meta's have finally come off their pedestal. In keeping the Eartsieged supply side stable you guarantee your increased profit ratio. ( even while BEING a goblin.) My start on that market has crashed prices to 30% of what they were, yet i still make a comfortable profit. In maxing out my profit on the supply side aswell and selling all the stuff there I'd open up my end market for everyone crashing it down to pulp. I think the confusion is more linguistic than anything else. If you mean that, for example, having alchemy makes your JC products inherently "better" and worth a premium, then you would be wrong. However, having professions where there is a dependancy on the output between the two (e.g. alchemy+jc or enchanting+crafting) can make you more efficient (in terms of time and AH listings if nothing else). This can make a difference in a competitive market where you can list your product at the same price as your competitors and make 5-10% more profit (at the very least, often much more) or list them at a cheaper price and gain more of the market while still being profitable. There really are only 3 professions I can think of that work that way though: enchanting, jewelcrafting, and alchemy. Leatherworking, BS, engineering and two of the gathering ones don't have this at all. Smelting (as opposed to node mining) does have some interaction with other professions as it allows you to turn ore into bars and avoid the carry trade there. You can also get titansteel cooldowns for free. Tailoring may also have interactions with enchanting as it is usually the cheapest way to mass produce mats to make dust, shards and essences, and it also requires dust to make some of its products, but that is fairly weak as well. True. However, I believe you could make a slightly more general case by removing alts from "multiple professions on multiple alts" I.e., there is this belief that if you have profession X your second profession needs to be Y. But if Z makes a lot more than Y, then you should use Z. There is no significant synergy even if you don't have any alts. Not understanding opportunity cost with farmed mats is such a common mistake.